Hello everyone and Happy Christmas Eve to you! I hope you are having a wonderful holiday season with those you love. I've spent the day cooking and crafting with my Mama, something I haven't had the opportunity to in many years. My sweet hubby is doing the last minute grocery shopping for us so that we can play together! My oldest son and his family will be here tomorrow, so we will have a house full of grandchildren and a very excited Lola (my little Yorkie)! We will be missing my youngest son who won't make it this year, but we did get a chance to be together earlier and I'll be seeing him a few days after Christmas. Life is good and I am blessed beyond measure! 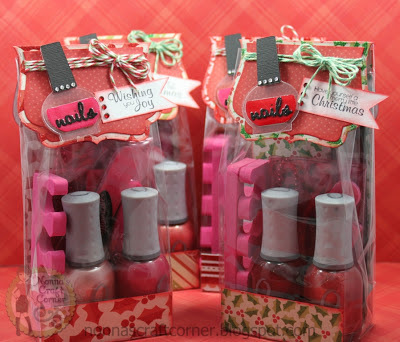 * Nail polish bottles are from the Cricut cartridge "Slumber Party" - they are cut at 2.5 inches. The bottle portion is cut from clear plastic. I used Glossy Accents on the nail polish portion of the cut. * The Christmas sentiments are also from Jaded Blossom and are stamped onto flags made with the Jaded Blossom "Flag Die"
I used some Trendy Twine in "Candy Cane" and "Twisted Lime" on these bags. I just love the way these turned out! Ok, it's time to go make the Oreo Balls to add to our Carrot Cake, Rum Cake, Fudge, Orange Balls and chocolate covered peanuts. I'm thinking that's enough with the sweets and I'm hoping someone bought me a pair of sweat pants for Christmas because that may be all I'll fit into very soon! Fabulous - wonderful gifts. Merry Christmas Tanya to you and your family. Hugs, Karon. Okay, first of all...you are making my mouth water with these yummy treats you are talking about. I LOVE Oreo balls but I have never heard of orange balls..you definitely have my attention. They sound delish. You may have to share that one! YUM!! 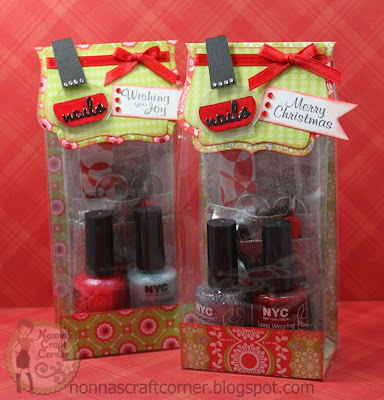 Your gift bags are awesome and what a FUN gift idea-so totally scraplifing from you, lol! Sounds like you are having a blast with your Mom. How fun! I hope you and your family have a wonderful Christmas Tanya! What great gifts. They turned out wonderfully! Have a very Merry Christmas! Awesome gift bags! Any girl would love to have one. What a cute idea! These are fabulous! Merry Christmas! This is super cute. I love this idea. I hope you have a very Merry Christmas To you and Your Family. Those are super cute! I hope you guys have a Merry Christmas! Enjoy your time with your family, it goes by fast! Love this!! You have made them so festive and packaging is everything! lol I will have to keep this in mind as they are just darling and a perfect little gift "just because". I hope that you & your family had a blessed Christmas. Hahaha Tanya, you always make me laugh! I need some sweatpants too :) your desserts sound amazing, u bet you kitchen smells fantastic! These little gifts are absolutely adorable and I'm sure the recipients are going to LOVE them. I hope you had a wonderful Christmas it sure sounds like you had lots a family fun!